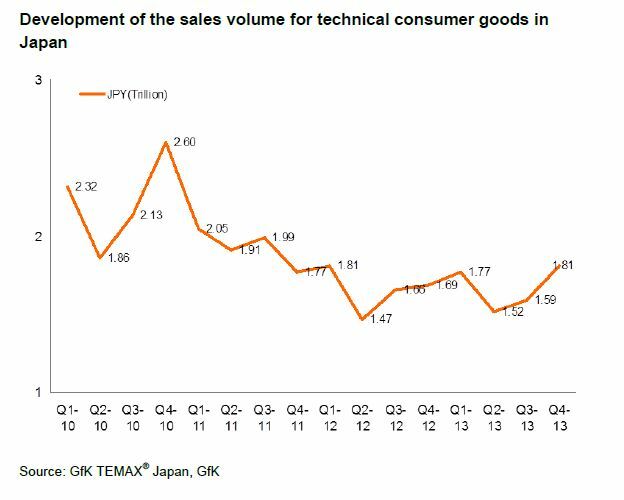 According to GfK Temax data about the fourth quarter of 2013 and the year 2013, the Japanese technical consumer goods (TCG) market recorded a growth in sales of 0.9% for the full year 2013, for the first time in three years. In Q4 2013, the TCG market grew by 7.2%. The IT sector grew by 26.8% in the fourth quarter, compared to the previous year. This sector recorded double-digit growth throughout the year. Because of the end of support for Windows XP in April 2014, sales of PCs in the B2B market grew in Q4 2013 more than Q3 2013. On the other hand, PC sales in the retail market continued to decline, as consumers moved to media tablets and smartphones. However, retail PC sales showed some improvement toward the end of 2013. The end of support for XP and a consumption tax increase in April 2014 contributed to this trend. The rise of the average selling price due to the weakening Japanese yen helped growth in value. Media tablets saw double-digit growth in Q4 2013, compared to the same period of last year, despite a slowdown in growth compared to Q3 2013. The market for media tablets has been growing since 2010, and it grew 80% during 2013. The photo sector increased by 15.2% in the fourth quarter of 2013, compared to the same period of 2012. It grew at a double-digit rate for the fourth quarter straight, marking seven consecutive quarters of growth. Although sales of compact cameras have been on the decline, digital still cameras recorded growth for four quarters in a row, due to strong sales of DSLRs. At the same time, the market for cameras with add-on lenses grew. The Major domestic appliance (MDA) sector increased by 12.0 percent in Q4 2013, compared to Q4 2012. Refrigerators, washing machines and other categories supported the positive trend. Sales of MDA increased in Q4 2013, after the government officially announced a sales tax increase (from 5% to 8%) in October. In the refrigerator market, sales of medium and large capacity machines grew as consumers sought upgraded designs and features, and a larger selection of models was available. Washing machine sales were buoyed by front loaders equipped with high functionality and large-capacity top loaders. The trend toward large-capacity washers reflects the fact that more and more households wash a large load of clothes in a single wash cycle, instead of washing smaller loads in multiple cycles. Sales in the telecommunications sector grew by 3.8% in Q4 2013, compared to the same period in 2012. In Q4, sales recovered from a loss of 16.4% in the third quarter. Mobile phones contributed to Q4 growth. Even though fixed-line telephone sales recovered to 0.6% growth, the market for fixed-line is declining. The Small domestic appliance (SDA) sector grew by 2.1 percent compared to Q4 2012, with strong sales for vacuum cleaners. Handheld vacuums and stick vacuums supported the vacuum cleaner market, showing growth for the sixth straight quarter. Sales of rechargeable (cordless) stick vacuums grew due to increased performance and a wider variety of models. Coffee maker sales grew for the sixteenth straight quarter, with strong sales of Espresso machines and coffee makers that use soluble coffee. Tea makers, a new product on the market, took off to a successful start. Some categories such as dental care, men’s shavers, hairstylers, and irons showed growth. Sales in the office equipment and consumables sector decreased by 6.1% in Q4 2013, compared to the same period in 2012. As a whole, sales in 2013 declined. 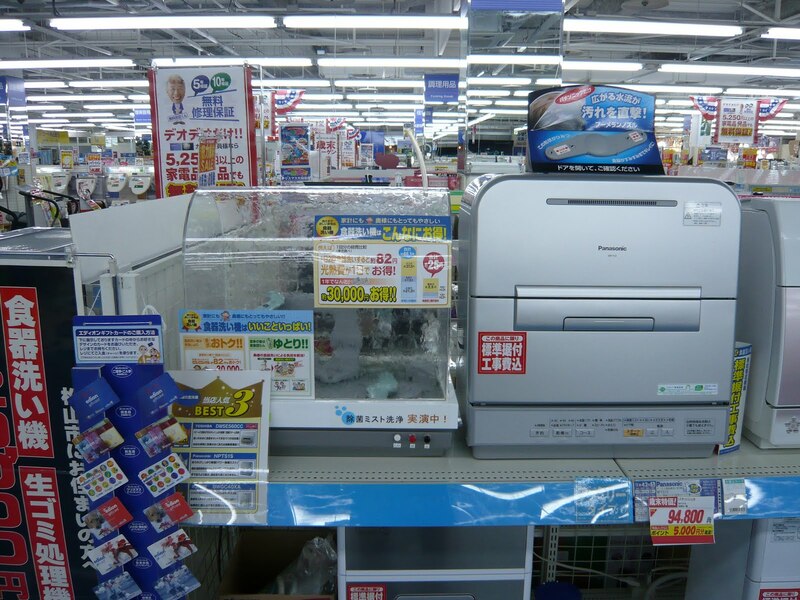 For multifunctional printers, Q4 sales declined by 7% compared to the same period in 2012. 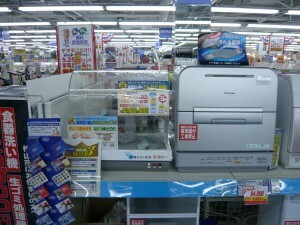 Inkjet cartridge sales also declined. Sales in the CE sector in the fourth quarter of 2013 decreased by 9.2%, compared to Q4 2012. Flat TV sales were up due to average sales price increases, marking sales growth for the first time since analog signals were switched off. On the other hand, DVD/Blu-ray disc recorders showed a double-digit decline. As with flat TVs, prices of recorders rose with sales of models with high-capacity hard disc drives and multiple digital TV tuners. In addition, sales of many other CE categories, including portable media players and camcorders, declined. The selling price of the digital products kept falling in the past several years. However, it turned upward due to the growth of the high value added models since the beginning of this year. It can be said that this is one of the signs of market recovery.